It seems that I watch too much of the History channel. For the second time in two reviews today I am going to mention a show on this vastly underrated network. There was a show on the History Channel that recently wrapped up its third and final season called Hunting Hitler. Following leads from a 2014 glut of documents declassified by the FBI, there is a chance that Hitler faked his suicide at the end of World War II and fled to parts unknown. Hunting Hitler picked up the stone cold trail and tried to make or break the case that Hitler may have lived beyond his demise in his bunker. From a purely historical standpoint, I found the series to be fascinating as it helped to shine a light on the sequence of events immediately following V-E day. From what I recall, the history books in schools seemed to spend little time here, opting instead to get right into America's escalating civil rights issues and the Vietnam War. But, there was a lot that history tried its best to sweep under the rug. For instance, while it might be a stretch that Adolf Hitler survived the war and fled to South America, several prominent Nazis did indeed do just that. Perhaps the highest ranking member of Hitler's inner circle to take this escape route was Adolf Eichmann, the man who masterminded the concentration camps that sent millions of Jews to their deaths. Operation Finale is the true story of the Mossad agent tasked with tracking Adolf Eichmann to Argentina. He is further ordered to infiltrate the growing Nazi allegiance in Argentina and capture Eichmann so that we can stand trial for his war crimes in Israel. I knew a little bit about this mission thanks to another movie (The Man Who Captured Eichmann) going into this viewing, so I figured that I was ahead of the curve. I was also able to draw upon the three seasons of Hunting Hitler as background to the general atmosphere in South America during the time that the movie takes place. Given this, I was prepared to enjoy a cat-and-mouse exploration of a complicated political extraction between two amazing actors and I wasn't disappointed. Oscar Isaac as Mossad agent Peter Malkin and Ben Kingsley as Adolf Eichmann delivered strong performances that added a personal intrigue to a story of monumental consequences. 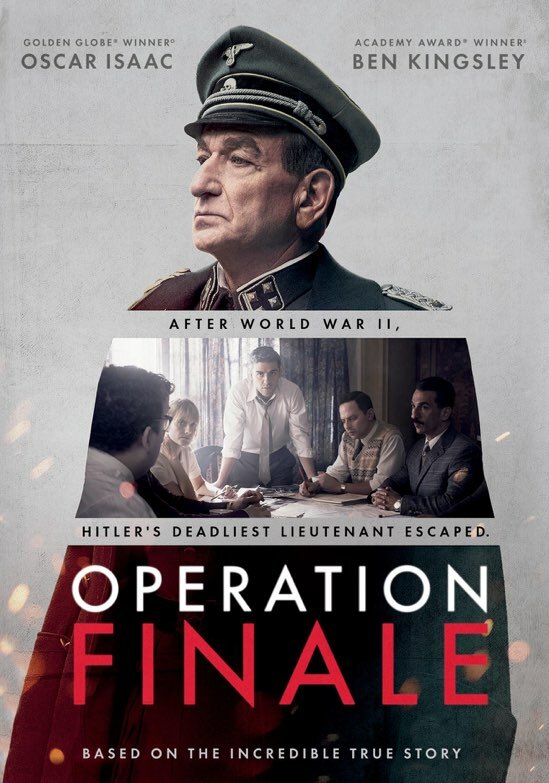 While The Man Who Captured Eichmann is probably the more faithful adaptation of events, the liberties that Operation Finale took were paid off in a more thrilling and compelling story. As I already had a pretty firm grasp of the historical story, I was completely intrigued by the interaction between these two men and how their actions would shape the world so many decades later. Oscar Isaac is one of my favorite young actors working in Hollywood today and I was again blown away by his nuanced performance as the Mossad secret agent. He gives a cool and understated take on the character which allows Kingsley's Eichmann to come through as the embodiment of evil that he was. And yet, there is something in Ben Kingsley's performance as well that humanizes Adolf Eichmann. The result of this is that the viewer becomes even more disgusted with his actions if that is even possible. A large part of the film centers on the back and forth between these two characters and while the dialog was most certainly fictionalized, it does give even more gravitas to the stakes at play. Make no mistake, the Holocaust is the evilest thing that we as humans have unleashed on our fellow humans. And yet, we still find it hard to reconcile the actions of the Nazis with what we know about human compassion. This is compounded by the world around us where nationalism and hatred again seem to be on the rise. Reminders of our dark past such as Operation Finale helps us to recognize the evil that persists to this day and to prevent it from escalating once again. Operation Finale should be required viewing in high school to further drive home the point of this regime's evil atrocities. Old pictures and words are fine, but dramatic moving pictures starring two of our finest actors is, perhaps, more compelling. Today's youth seem more interested in the moment and the present, but a good film could go a long way in changing collective mindsets. Operation Finale is such a rare gem that should be seen by more people. 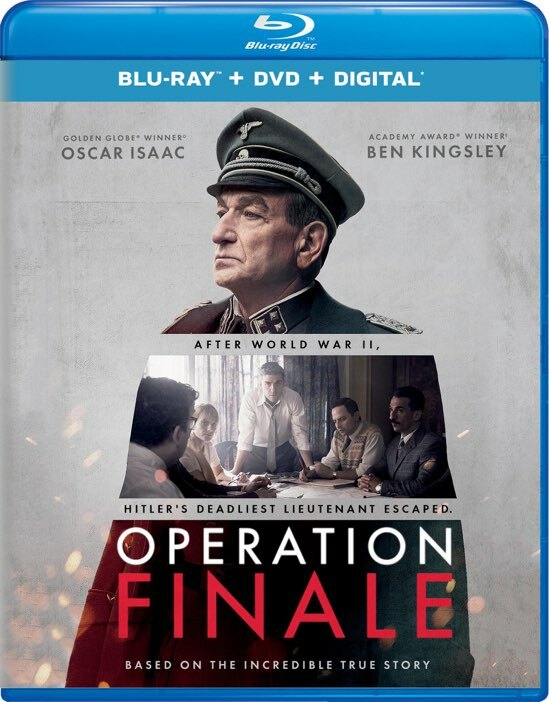 Operation Finale is now available on Blu-ray and DVD.